In the first debate between presidential contenders Donald Trump and Hillary Clinton, Trump repeatedly relied on troublesome and false facts that have been debunked throughout the campaign. Clinton stretched the truth on occasion, such as when she tried to wiggle out of her 2012 praise of the Trans Pacific Partnership as a “gold standard.” But her misstatements paled in comparison to the list of Trump’s exaggerations and falsehoods. Trump once again asserted that the 2008 Clinton campaign was responsible for spreading the myth that President Obama was born in Kenya, when that is false. He claimed that “thousands” of American jobs will leave the country when Ford shifts small-car manufacturing to Mexico, but no one here will lose their jobs. He also falsely claimed that he was against the Iraq War, when all available evidence demonstrates that he supported it until the rest of the country began to turn against it in 2004. He also once again falsely said he started his business with a “small loan” from his father. Here’s a roundup of 23 of the most noteworthy claims that were made. As is our practice, we do not award Pinocchios when we do a roundup of facts in debates. Ford is moving its small car production to Mexico, but the expansion will not affect U.S. workers. The company has said that while production of Ford Focus models will shift to Mexico, its plant in Michigan will build other, larger vehicles. Ford and many other automakers are finding Mexico more attractive for several reasons. “The cost of labor is indeed greater in the United States, which makes producing labor-intensive small cars in Mexico more profitable. The United States also has advantages, though — inexpensive electricity, experienced technicians and access to sophisticated materials and equipment — often means building larger and more expensive cars is cheaper in this country,” our colleague Max Ehrenfreund wrote. Clinton exaggerates here. We know of three years in the 1970s when he did pay federal income taxes. But there were at least five years in the 1970s, 1980s and 1990s when Trump did not pay any, or nearly any, income taxes. Trump’s tax plan would raise federal income taxes on more than half of America’s single parents and one-fifth of families with children, according to an analysis by Lily Batchelder, a New York University expert on tax policy who formerly worked for Obama’s National Economic Council. Mark Zandi, a well-respected economist, did issue a report saying that if Trump’s economic plans were fully implemented, 3.5 million jobs would disappear, incomes would stagnate, debt would explode and stock prices would plummet. But the report also said it was highly unlikely that Trump would get many of his plans approved by Congress, even if it is controlled by Republicans, because so many of his positions are so a departure from Republican principles. Even so, the report said the U.S. economy would likely suffer under a Trump presidency. His report also said that if Clinton were able to fully implement her economic plans, the economy would add an additional 3.2 million jobs during the first four years of her presidency. Combined with anticipated job creation under current law, that adds up to 10.4 million jobs. But the report also said that Clinton would face significant roadblocks to getting her economic plan through Congress, resulting in far fewer job gains. Trump cites an Internal Revenue Service audit as his justification for not releasing his federal income tax returns, but the audit does not prohibit from releasing the returns. Richard Nixon, who started the tradition of presidents and presidential candidates releasing their returns, did so in the middle of an audit. Moreover, Trump has not released his tax returns from before 2009, which are no longer under audit, according to his attorney. Presidential candidates have no legal obligation to release their returns, but there has long been a tradition to do so for the sake of transparency. Hillary Clinton has released three decades’ worth of tax returns. While Trump has not released the returns, his long history of litigation has given the public a sense of what is in his returns. Tax information made public so far show Trump did not pay any, or nearly any, income taxes at least five times in the past 40 years. “As far as tax return, you don’t learn that much” from tax returns. Trump is being misleading. Tax experts say that tax returns provide insight about a person’s finances in several key areas. Trump claims he has given $102 million to charity in the past five years, but a Washington Post investigation found not a cent in actual cash — mostly just free rounds of golf, given away by his courses for charity auctions and raffles. Trump’s tax return would clear up exactly how much he has really given to charity — indeed, whether he has given anything at all. Trump is right. Clinton is subtly adjusting her words here when confronted with a question about her consistency on policy positions. But the fact is she never used the word “hoped.” Instead, she was more declarative, using the phrase “gold standard” when she was Secretary of State. Trump cherry-picks the increase in violence in Chicago, but this is not indicative of overall crime rates, which have been declining for years. Moreover, while Trump says stop-and-frisk policies should be enacted in Chicago as it was implemented in New York City, those policies have not been correlated with crime. 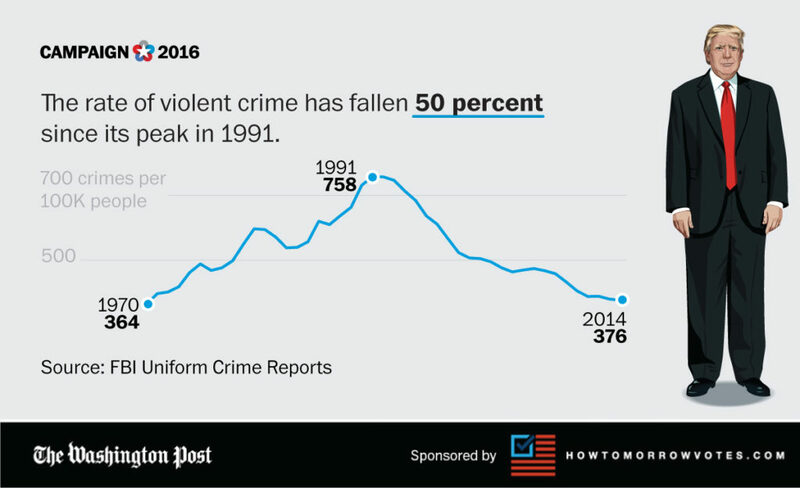 While violent crime overall has been declining for about two decades, there was a sharp increase in the violent crime rate in 2015. Homicides have continued to spike in major cities this year, though the rates remain far below their peak in the late 1980s and early 1990s. Law enforcement officials, including the FBI, have voiced concerns about the uptick in crime in 2015. Criminal justice experts warn against comparing crime trends from short periods of time, such as month over month or year over year. An annual trend can show a trajectory of where the trend might be headed, but still does not give a full picture. Many criminal justice experts say crime trends are determined over at least five years, preferably 10 or 20 years, of data. Trump praises stop-and-frisk policies under former New York City mayor Rudolph Giuliani. 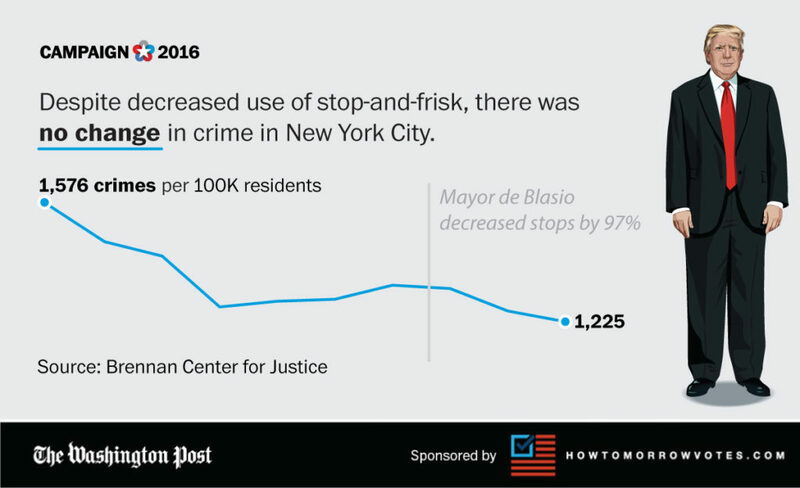 But it’s debatable whether the stop-and-frisk policies had such a direct impact on crime, as Trump suggests. Crime is affected by many factors, and New York’s decline in crime mirrored the decline in many other major cities at the time. Moreover, crime was declining for four years before Giuliani took office, and it continued to decline for 14 years after he left. We awarded Three Pinocchios to Trump’s claim attributing stop-and-frisk policies to the decline in crime. Trump also claimed that “murders are up” in New York. That is incorrect. Homicides in New York are down so far this year from the same point last year, according to the New York Police Department. But homicides did see an uptick in New York City in 2015, similar to trends in numerous other cities. Democrats, including Clinton, frequently point out that people on the terrorist watch list can purchase a gun. But the proposal that Democrats have made in Congress wouldn’t ban such purchases automatically. We have awarded Two Pinocchios to this claim for lack of context. Clinton is right that Trump emphatically urged the United States to remove Libyan dictator Moammar Gaddafi from power. This is just totally false. Trump said he had “numerous conversations with Sean Hannity” prior to the invasion, expressing his opposition to the war. These appear to be private conversations. Hannity told Erik Wemple Blog that Trump “would watch the show and call after and we argued a lot about” the war. We should note that Hannity is one of Trump’s biggest boosters and has never asserted that Trump made these private claims to him until recently, even though this has been a constant source of controversy during Trump’s campaign. Hannity has also not offered any evidence to back up his claim that he and Trump had such conversations at the time. [Update: During the debate, Trump also cited his January 2003 Fox News interview with Neil Cavuto as proof of his early opposition. The day after the debate, Fox News cited this clip, declaring it “backs up Trump on Iraq War opposition.” As our timeline shows, Trump was not clearly against the war in this interview, either. Regarding Clinton’s statement, the key issue with the email controversy was that Clinton had a private server — not just a private email — and she never used her designated State Department email account, which would have kept records of emails subject to requests under the Freedom of Information Act. The accuracy of Trump’s claim depends on whether he is referring to her decision to use a private server, or if he is suggesting that Clinton purposefully intended to mishandle classified information. On the former point, yes, Clinton chose on purpose to use a private email server. On the latter, the FBI would disagree. Click here for our round-up of 14 fact-checks about the Clinton email controversy. How can a federal agency, the Immigration and Customs Enforcement, endorse a candidate? Trump is actually referring to the National Immigration and Customs Enforcement Council, which is the union representing ICE officers. In a statement released by the campaign, National ICE Council President Chris Crane said it was the union’s first-ever endorsement. Trump is basically right. The trade deficit in 2015 was $762 billion, according to the Census Bureau. Clinton is correct. Trump in May caused a stir when he suggested the United States should borrow more and renegotiate new terms later. “I would borrow, knowing that if the economy crashed, you could make a deal,” Trump said on CNBC. The comments caused angst in the financial markets, as the U.S. Treasury securities are considered the world’s safest investment precisely because the United States is at low risk of default. Renegotiating the terms would be seen as a form of default. Trump later walked away from his comments, claiming he had been misquoted. To support the debunked notion that Clinton’s campaign originated “birther” rumors during the 2008 presidential campaign, Trump pointed to these two examples. But they don’t add up to much of anything. Solis Doyle did say in a recent CNN interview that in December 2007, a volunteer coordinator in Iowa forwarded an email perpetuating the birther conspiracy. Clinton “made the decision immediately to let that person go,” Solis Doyle said in the interview. As in the instance with the Iowa volunteer coordinator, the campaign denounced isolated instances of Clinton’s staffers questioning whether Obama was Muslim. We found that there’s no evidence that she or her campaign were “pressing it very hard” — though some of her supporters did perpetuate the claims in the bitter 2008 primary campaign against Obama. “As multiple, independent fact checkers have affirmed in the years since, neither the 2008 campaign nor the candidate ever questioned the President’s citizenship or birth certificate. Period,” said Clinton campaign spokesman Josh Schwerin. Trumps mixes up a lot of things here. The United States pays about 22 percent of the common-fund budget for the North Atlantic Treaty Organization. But the volume of the U.S. defense expenditures effectively represents 73 percent of the defense spending of the Alliance as a whole. But that does not mean that the United States pays 73 percent of the costs of running NATO. The figure reflects the fact that United States, as a world power, projects its might across the globe. Experts say it is all but impossible to calculate how much of overall U.S. defense spending is devoted exclusively for NATO, but there is little dispute that most members are not meeting their commitment to have defense expenditures should amount to 2 percent of each country’s gross domestic product. As for Trump patting himself on the back for spurring NATO to focus on terror, he’s kidding himself. The plan was in the works long before Trump starting saying NATO was obsolete. This data checks out, according to research by the Brennan Center for Justice. Nationally, the violent crime rate has fallen by 51 percent since 1991, and property crime has fallen by 43 percent. As Clinton noted in her response, the terms of departure from Iraq were originally set by the George W. Bush administration. The Bush administration signed a Status of Forces Agreement (SOFA) with Iraq in 2008 that established a deadline for the withdrawal of all U.S. forces from Iraq by Dec. 31, 2011. But it was widely expected troops would remain after a negotiated extension. Obama, meanwhile, was pleased to be able to run for reelection in 2012 on a claim that no more U.S. troops were left in Iraq. To a large extent, the Islamic State of today is simply an outgrowth of al-Qaeda of Iraq, which emerged after the 2003 invasion of Iraq. Clinton was Secretary of State when Obama made decisions that could be seen as contributing to the rise of the Islamic States, but ironically she was one of the loudest forces for keeping a residual force in Iraq and for intervening in Syria, such as arming the rebels. Both steps advocated by Clinton might have thwarted the emergence of the terror group. Moreover, Clinton was not Secretary of State when Obama all but ignored the Islamic State as it moved back into Iraq in late 2013. Indeed, there are victims of homicide by undocumented immigrants, including by those in gangs. But there are two important data points to remember when Trump talks about this. First, the vast majority of unauthorized immigrants do not fit Trump’s description of aggravated felons, whose crimes include murder. U.S. Sentencing Commission data shows homicides are a small percentage of the crimes committed by noncitizens, whether they are in the United States illegally or not. Second, illegal immigration flows across the Southern border in fiscal 2015 were at the lowest levels since 1972, except for in 2011. The apprehensions in fiscal 2016 so far have exceeded fiscal 2015, but still indicate an overall decline. ISIS does not control oil in Libya. Trump has been called out before on this point, but he keeps saying this false claim. As for keeping the oil in Iraq, This is nonsensical. The Bush administration invested a lot of diplomatic effort in assuring Middle Eastern allies that the United States was not invading because of Iraq’s oil fields. Moreover, oil revenue was crucial to ensuring a functioning Iraqi state — which is why insurgents often targeted the oil sector in Iraq. In any event, seizing the oil of a sovereign nation after invading it would be considered a “grave breach” of the Geneva Conventions, one of the cornerstones of international law, as well as other international agreements. Maybe Trump’s staff should arrange a tutorial on international law.